Sneak Preview of Lake Oswego’s Unveil Your Art! 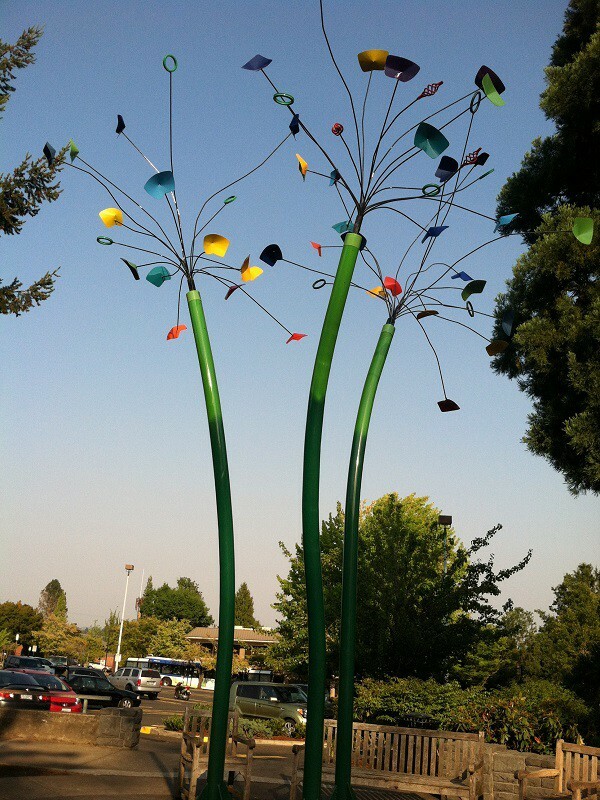 This kinetic steel sculpture, “Aspens” by Reven Marie Swanson will be at home on the corner of 5th and A Avenue for the next two years as part of Lake Oswego’s Gallery Without Walls. I can already tell I’m going to be a big fan for this year’s installment of new sculptures to the Gallery Without Walls. Having gotten a glimpse of a few of them, I’d be hard pressed to pick a favorite. 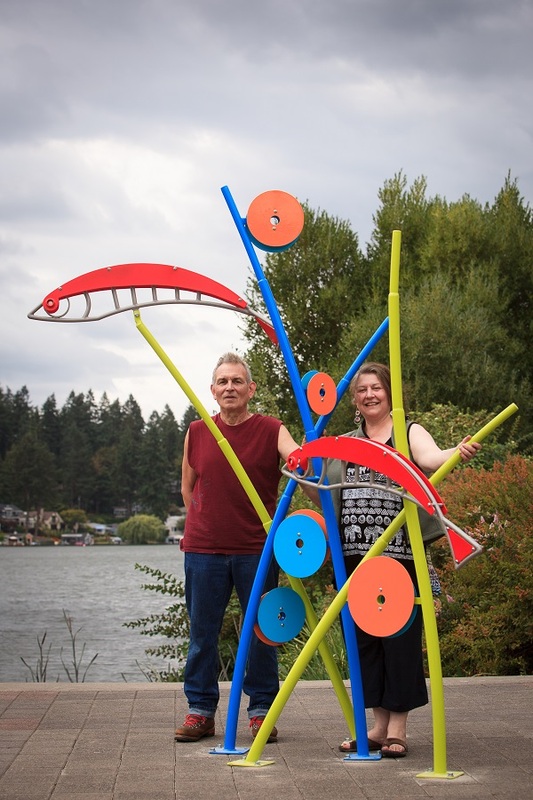 The Lake Oswego Arts Council is planning a celebration today, Sunday, August 30, to both herald in the new sculptures and recognize the 15 year history of Gallery Without Walls. Both are worth toasting and here’s why. 1. The Gallery Without Walls features over 60 permanent and loaned works of art spread throughout Lake Oswego. Thirty of them are on loan from the artists and rotate every two years. 2. Lake Oswegans aren’t the only ones who appreciate the Gallery Without Walls. It was featured in Sunset magazine and won a City Livability Award from the U.S. Conference of Mayors in 2007. This work by Joel Heidel and Angelina Marino-Heidel, called “Journey Home,” can be found in lower Milllennium Plaza Park. (Photo taken by Deb Hollister with Pure & Simple Graphics). 3. There are several ways to take in the Gallery. You can arrange fora private guided tour by one of the Art Council volunteers or take advantage of scheduled tours, like the ones set for today, beginning at 4:45. You can pick up a brochure at City Hall or download the free app for a digital tour. 4. Fourteen new sculptures will be added to the downtown walking area this year. 5. Festivities begin in Millennium Plaza Park at 3:00 p.m. Steel Away Trio will provide music and entertainment. The Road Dog Café will be on site to provide food and drinks for purchase. Arts council staff will be on hand to discuss the program and everyone is welcome to some free banana cake from New Seasons. Artists and their sponsors will be introduced beginning at 4:00 p.m. with docent and artist-led tours taking off at 4:45 p.m. If you’re interested in touring homes in town because you’re looking to move to Lake Oswego or even change neighborhoods, give me call at 503.939.9801. I’d love to show you around. This entry was posted in Lake Oswego Arts, Things to Do in Lake Oswego and tagged Lake Oswego Arts Council, Lake Oswego Gallery Without Walls, Lake Oswego Oregon, Unveil Your Art!. Bookmark the permalink.